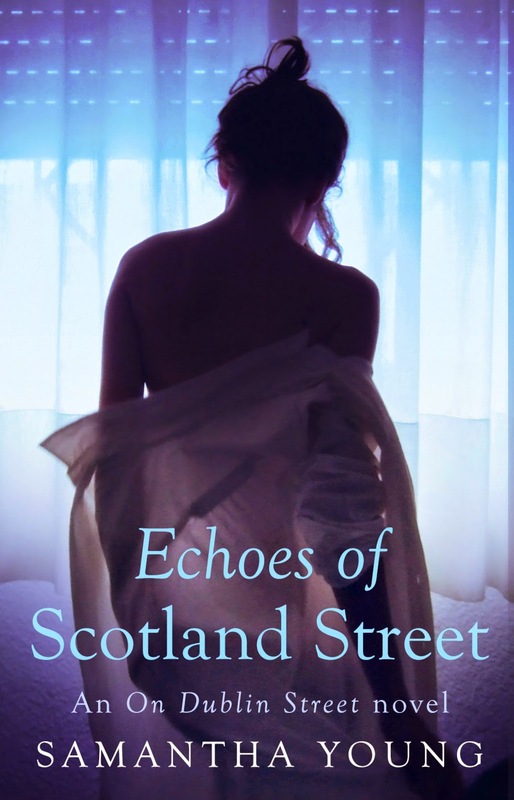 Daisy Chain Book Reviews: Book Review: Echoes of Scotland Street by Samantha Young. Book Review: Echoes of Scotland Street by Samantha Young. Release date: October 7th 2014. Series: On Dublin Street #5. Other Books in Series: On Dublin Street, Down London Road, Before Jamaica Lane, Fall From India Place. Note: This is a next-in-a-series book. As such here may be spoilers for previous books in the series in this review. Some girls love a bad boy, but, at twenty-four and after a series of toxic relationships, Shannon MacLeod has had enough. Cutting ties with a past that casts too many dark shadows over her life, Shannon relocates from Glasgow to Edinburgh, where she plans to start afresh – and men are most definitely NOT on the menu. First up, Shannon needs a job; and her new job as a receptionist at a renowned tattoo studio seems like a perfect fit. That is, until she meets her new boss: Cole Walker is just the kind of guy Shannon does not want in her life. Confident, cocky and good-looking in a ‘he so knows it’ kind of way, Cole sets his sights on Shannon from day one, flirting with her to the point of distraction, or maybe harassment. Shannon has seen it all before. Cole Walker is just another tattooed bad boy who doesn’t want to take no for an answer. But Shannon isn’t interested in him – she’ll never be interested in a guy like Cole Walker – not after what happened back in Glasgow. Hold up. Rewind. Cole Walker – bad boy?! Now, if you’ve followed this series from the start, you’ll know that Cole Walker is anything but a bad boy. Yes, Cole may look like a bad boy, with all his tattoos and his cocky attitude (I partly blame Cam for that! ), but readers know him to be kind and caring, loyal, and above all, respectful towards women. After all, he was practically raised by his sister – the feisty Jo- who would not put up with any bad boy behaviour from her wee brother. Cole’s attraction to Shannon is immediate and his flirting a little OTT at times - but what we already know (and what Shannon pretends to have forgotten) is that these two met once before – nine years ago – and they had an undeniable connection. So, when they meet again, Cole is over the moon. But Shannon isn’t the girl he met all those years ago – a whole lot has changed since then. Shannon shuts Cole’s advances down – she just doesn’t want to know. But why? What has happened to this girl to cause her to act this way? And can Cole break down her defences and find the warm, friendly, funny girl he met on Scotland Street all those years ago? Shannon has been badly burnt by past relationships, yes, but I have to admit she made a bad first impression on me with her treatment of Cole. That said, Cole is not perfect here. He’s Shannon’s boss, and for me, he totally overstepped the mark by coming on so strong in a work environment. I mean, if this was real life, Cole Walker would be in trouble. But, it’s not real life, and so I’m not going to harp on about that particular aspect of the story. It annoyed me a little bit, I guess, as did Shannon who would tell everyone around her that in no way was she judgemental while very obviously judging everyone on sight. She judges Cole for his looks, attitude (he’s good-looking and knows it), and his tattoos, and later she judges her sister (who, admittedly, is not very nice) for not having any tattoos because in Shannon’s opinion she’s not at all creative and is happy with the way she looks without any artificial enhancement (which sounds like a pretty good way to be if you ask me!) I wasn’t a huge fan of Shannon, truth be told; she was a little too hostile, a little too opinionated, and little too cold at times for me to ever really warm to her. Her attitude towards Cole thaws as time goes on, and she’s got a good heart underneath that tough exterior, but at the end of the day, she just wasn’t a favourite of mine. Still, while Shannon’s character was something of a miss for me, I definitely enjoyed this latest instalment in the On Dublin Street series. The first book (Joss and Braden) is still my favourite (and the hottest!) but this was a good read, with secondary characters such as Rae (Shannon’s colleague and flatmate) a particular (foul-mouthed!) highlight. The tribe is back too – that’s what the ever expanding cast of characters from previous books is now fittingly referred to – so we meet Joss and Braden, Cam and Jo, Nate and Liv and Hannah and Marco (and all their kids!) in the course of this book, and I’m pleased to report that apart from one medical emergency everyone is doing very well. By the end of this book Braden is in his mid-forties – can you believe that so much time has passed?! He’s still got it, though. Shannon totally comments on his hotness. In fact, Shannon comments on everyone’s hotness. Hey, I guess all those guys are really hot! So, will Cole win Shannon over so that they can start on adding to that ever-expanding tribe? If you’re a reader of these books, then you know the answer to that! These books sure do follow a formula, and it’s a winning one at that! Echoes of Scotland Street is yet another compulsive read from Samantha Young with well-developed characters, sparky dialogue and some of the hottest bedroom action you’ll see this year with one of the hottest guys in town. Cole Walker – you were definitely worth the wait! Joss and Braden are my faves too! (followed by Liv and Nate). The guy on the US cover is all wrong for Cole. ALL WRONG! !